⚓ T196396 Adoption request for "tools-info"
In my messages to Hedonil, I said I would host the replacement tool there, but the replacement is a Node application with a completely different UI. I now think it may make more sense to put in a redirect. It has also occurred to me that the auto-generated dumps of the Toolforge views are no longer working (last updated October 2016): https://tools.wmflabs.org/tools-info/schemas.php?schema=views. I would like to investigate this as well, and if I can get them working, perhaps migrate/redirect them to the sql-optimizer tool too (since it makes more sense there I think, as opposed to "Tools Info" which has a Toolforge file browser and other features unrelated to the replicas). I think it's better to have two or more people so that they/we can double check each other. I can take this over tonight. Add me there. I think I did it. Let me know. If more help is needed, let me know. This is more complex than I thought. Lots of files. I looked at the files. except the replica.my.cnf and .my.cnf which are part of the tool (the user starts with "s"), there is no other password or sensitive data stored there. so it's clear to take over. Shall we take a backup of the files? I don't plan on deleting anything, if that is the concern. I may try to fix the view dumps, but the SQL Optimizer itself will simply be redirected. Let's go ahead with this? Or are there other concerns / objections? I think @Ladsgroup can add @MusikAnimal to the maintainer list. Added @MusikAnimal there. Thank you for your help! 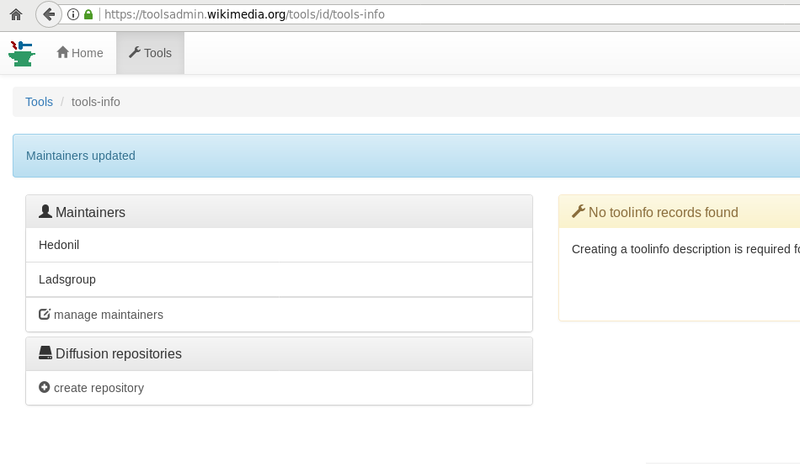 CommunityTechBot renamed this task from vnbaaaaaaa to Adoption request for "tools-info".